Title: "Nth Ways To Die"
Summary: After an evening of pondering the mysteries of the Nth Metal, Carter Hall takes to the skies as Hawkman to get some air. His relaxation is interrupted by a trio of well armed and armored assailants on hoverboards, who attempt to incapacitate and capture our hero. They are not expecting Hawkman's fierce response, however, as he quickly subdues two of them. After taking down the third one, Hawkman demands an explanation, but his foe dies in a flash of energy rather than reveal any information. Thinking the threat is over, Hawkman receives a new shock -- a message is transmitted to him through the Nth Metal itself, directly into his brain. The message is garbled, however, and all he can see is a glimpse of a beautiful red haired woman and some broken syllables. Then, as suddenly as it appeared, the message vanishes. Winging back to his apartment, Hawkman doesn't make it inside before an explosion levels his home, leaving it a smoking ruin. After grabbing some clothes and a copy of his latest research from one of several of his secret storage lockers hid throughout the city, Carter meets up with Emma, where they discuss the alien hieroglyphs they found on Morphicius's containment ship and how the longer he studies, the more Carter understands them. Their meeting is cut short when another assailants arrive, this time lead by their commander, Ironside. Hawkman and his armored foe tangled, but Ironside gets the upper hand when he captures Hawkman in an energy bubble. Ordering his men to get Emma, Ironside takes Hawkman captive. Later, Hawkman awakes in a small cage, being address by an armored humanoid named Xerxes. Xerxes tells our hero that he is an antiquities broker, and that he is currently dealing with several potential buyers for the Nth Metal armor. As such, he has arranged a demonstration of the armor's ability -- as he leads Hawkman to a dirt floor arena, where three gladiators await his arrival! Review: Well, here we are. The new "era" (so to speak) of The Savage Hawkman has begun and very quickly we find out hero knee deep in mysteries and danger. I think the part which had everyone guessing was the writing team of Rob Liefeld and Mark Poulton. Now, Rob has said that he is doing pretty much all of the writing work, with Mark doing some assists. Upon reading the issue, it shows -- the scripting and dialogue all sound remarkable in line with what Rob was doing over on the last few issues of Hawk & Dove. The script itself I thought was slick. We get a pair of action sequences which give the art time a chance to show off; we find out a good deal about our hero and how he operates in his civilian identity, and a pair of new threats debut without getting spotlight introductions. So that was dead on. Joe Bennett's pencils cannot be overstated. As much of a fan of Philip Tan's work as I am (and those who read this site know how much I dig his work), Bennett's rendering of Hawkman seems much better suited for this New 52 universe. Little touches and embellishments -- such as the winged hawk belt buckle piece, the feather details on the straps, and the spiky bits on the boots -- help bring the Savage costume to life. And the return of a traditional looking weapon (in this case, an ornate battle axe) is a welcome development. The weapon itself is also highly detailed -- the bottom of it, for instance, is a hawk's talon, and grasps a sphere, which Hawkman uses as a blunt-edge weapon during combat. I have talked at length previously about Rob's cover, and I don't really care for it. But at the end of the day it's just a cover, and I try not to judge books (and comic books) by them. Overall, I really enjoyed this issue. I am very much champing at the bit for the next issue and to see where the story goes. We have been teased that the fight which opens the next issue is going to be an epic, and from this cliffhanger I believe it. So, after all the previews and hype, The Savage Hawkman #9 was released yesterday. New creative team, new direction -- it all starts here. So what's the verdict? I can't quite put my finger on it, but the earnest script by Rob Liefeld and Mark Poulton is a great fit for Carter Hall. We learn some new facets of our hero and his civilian life. 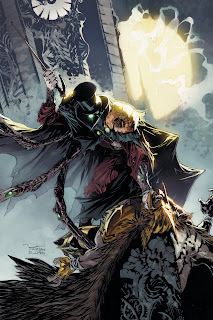 New mysteries are introduced about the Nth Metal, and those who would possess it, as well as the origins of Hawkman himself. We meet some new villains, and there's the promise of even more foes. And all of it looks amazing, thanks to the pencils of Joe Bennett, the inks of Art Thibert, and the colors of Jason Wright. I'll always be a fan of Philip Tan, but this new art crew seems born to handle the adventures of the Winged Wonder. I'll admit, I was very skeptical when Rob Liefeld was announced as the new writer of this book. But Rob, Mark, Joe, and the entire team working on Savage Hawkman have really made this Hawkfan believe. Let's pick up the axe and fly, folks. It's time to soar. Well, Savage Hawkman #9 just came out yesterday, but we have a preview of #10 already, thanks to Rob Liefeld's Twitter! Bennett's work still looks brutal and action-packed! Can't wait to get ahold of #9 and check out the new team! Image: The Savage Hawkman #10 preview, 2012, Joe Bennett. The Savage Hawkman #9 -- All of the time for hype and hoopla is over; the rubber meets the road today (or, when my box arrives in my case). What will the future of our Savage hero be? Will Rob Liefeld and company be the one to get the Winged Wonder into the big time? Or will it be another footnote in the long history of the character? It all starts here. I thought that Liefeld's writing work on Hawk And Dove was promising, and his teases have been somewhat interesting. Bennett's pencils look like a perfect fit for the physical stories the solicits have promised, and his Hawkman has looked powerful and rugged in the previews. So yeah, I'm excited about this new creative team and I hope others are excited about it as well. What do you think folks? Will you be checking out the new creative team on Savage Hawkman? Summary: After being ambushed by the alien shapeshifter Aksana, Hawkman is on the defensive, with his foe not holding anything back. Deciding that he must do the same, Hawkman grabs Aksana by the throat and prepares to finish her, when she gasps and pleads not to kill her. 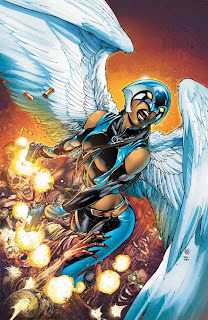 Hawkman releases her, and hears her out -- agents from her homeworld have tracked her to Earth for a crime she did not commit, and she needs his help. When Hawkman suggests that she go see her employer, Dr. Kane, Aksana says that he will simply sell her out. Hawkman wants nothing to do with it, and turns to leave, but Aksana says that if he leaves, he might as well kill her now. Angry, Hawkman caves and agrees to help her. Carter Hall goes to visit Professor Ziegler, who had called him to look at something. When he arrives, though, Emma informs him that there is nothing for him to examine, and it seems that the Professor's dementia is increasing. On a Midtown rooftop, Hawkman and Aksana meet up, Aksana having tracked the mental chatter of the agents. She tries to psychoanalyze Hawkman, claiming that there is a black hole welled up inside of him, and that it is masked by the deep pit of hostility and anger he has. Before the analysis can go any further, the three agents arrive. They transform their arms into long tentacles filled with sharp barbs, and attack. Hawkman throws himself into the combat, but soon finds that he is the target, not Aksana. Hacking his foes apart, after the battle Hawkman calls out Aksana for her betrayl. She claims that Dr. Kane forced her to do it, but at this point Hawkman doesn't care, and he wings off. As he flies away, he thinks to himself that, despite his better judgement, he wanted to help Aksana. And that if he is lucky, those feelings will be buried inside the black hole in his chest. Review: In an effort to finish this issue before #9 comes out this week, here we are. As a final issue for this creative team, this is sort of an odd turn. In one sense, it does reflect on what has come before (with the return of a character from the first arc), and is seemingly setting up new threats for the next team, but the whole issue is fairly low key. 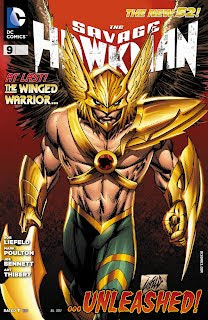 The insight into Hawkman is somewhat trite (he's angry, and the anger is a mask for the emptiness at his core), and the enemies are no real threat. So what was the real point of this issue? I think that this was meant as a sort of transition issue, finishing up with some of the introductory Hawkman stuff and beginning the branching out of the story. Of course, it still is, it just won't be this crew handling that new direction. That having been said the action was just fine, and we get to see a lot of hack and slash. Tan's art is very nice, but I am a fan of his work so that is no surprise. The script doesn't really offer that much to comment on, as the story is very simple and straightforward. But there is something I do want to comment on. Now, I am not one of these reviewers who finds subtext in everything. But it seems to me that the back and forth tension between Hawkman and Aksana is supposed to be a little deeper. First off, the title is "Strange Bedfellows," a double entendre if there ever was one. 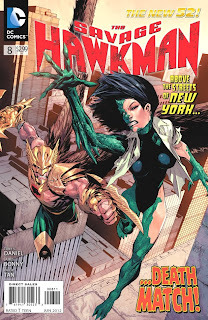 On the first page, Aksana says she is disappointed in Hawkman's "performance." On the splash page, she is on her back facing up at the big, muscular Hawkman who is above her, his hand around her neck and her hands grasping at his arm. Later, after the battle, both are covering in dripping goo, including Aksana having some on her face, and Hawkman's long, pointy Nth metal sword dripping with it as he levels it at her, for crying out loud. I'm sorry, this seems pretty obvious to me. Or am I being crazy? In any event, this was a perfectly serviceable issue which doesn't really add that much to the narrative nor really give us much insight into our rage- and hatred-filled hero. I also want to say "Thanks" to Tony, Philip, James, and the rest of the crew. I appreciate what you folks did even if it didn't last as long as I am sure you all hoped it would! 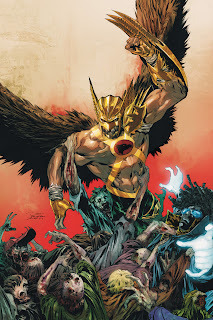 Image: The Savage Hawkman #8, 2012, Philip Tan. Thanks to Complex.com, we now have a preview of the first issue of the new creative team's first issue of The Savage Hawkman! Click on the link above to have a look! I did not read the preview, only looked at the art, and I have to say, Joe Bennett's work looks fantastic! It's a real change of pace from Philip Tan but so far looks like a perfect match for Hawkman. Also worth noting are Art Thibert's inks, which lend a good amount of heft and weight to the pencils. If nothing else, this book will look great. The Savage Hawkman #9 hits stores on May 23! 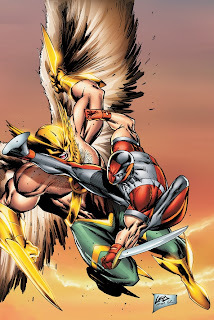 • HAWKMAN vs. ST. BASTION – with PIKE, an incredible assassin with key info about Hawkman's past, caught in the middle! I am guessing that the Diehard-looking person on the cover is the aforementioned Pike, as we have seen St. Bastion previously. One thing you can always say about Rob Liefeld is that he likes to introduce new characters, and this does not seem to be any different here. We haven't seen the first Liefeld issue yet, so I still am not sure what we're going to get, but from all of the solicitations we have seen and the hype we have heard, I think it's a safe bet that it's going to be action-heavy. So, personally, I am hoping for some straightforward Fighty McFightenstein (TM Andrew Leyland) superheroics. Also, I would like to point out that this image may be the best Hawkman image we have seen from Rob Liefeld so far -- use that comment as you will. • THE GREEN LANTERN, THE FLASH and HAWKGIRL in action! • The debut of the all-new ATOM SMASHER! • A monstrous evil claws its way out of the poisoned soil of EARTH 2! What can you say about this solicit? It hits the right notes and has me interested in reading it -- I mean, Alan Scott, Jay Garrick, and a new Hawkgirl in action? Just go ahead and take my 3 bucks already. I have to wonder, we saw Al Pratt in the first issue, will he be the new Atom Smasher -- as opposed to The Atom? Either one works for me, honestly. This book is shaping up to all sorts of crazy and I'm eager to see how it unfolds. So folks, what do you think? Do these solicits make you interested in reading about these Winged Wonders? Image: Earth 2 #4, 2012, Ivan Reis. We've already seen a glimpse of the new design of the Earth 2 Hawkgirl, but now we are getting an even better look! 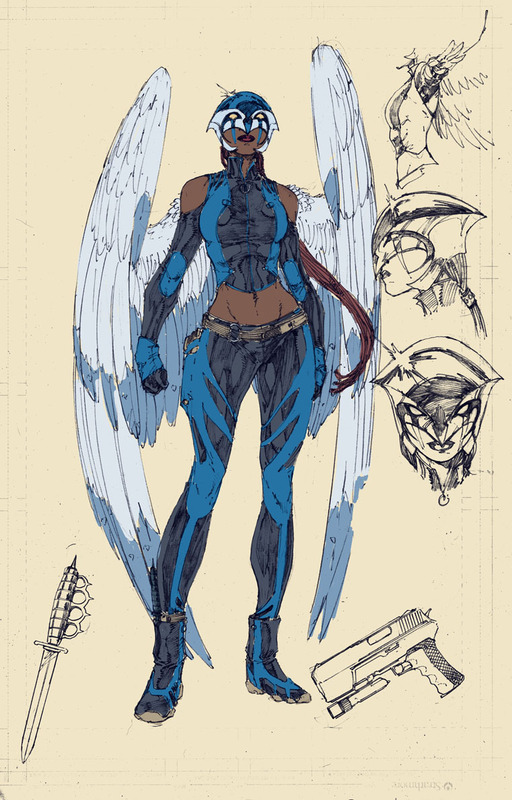 From Brett Booth's blog, Demonpuppy's Wicked Awesome Art Blog, we have this design sketch for our new alternate Earth Winged Wonder! One of the cool things about the New 52 at DC is all the new designs. I was asked a few months ago to try my hand as the new Hawkgirl for Earth2. After talking with the writer and editors I got an idea. and managed to actually put it on paper! Great fun, and I got it approved on the first try! WhoooHooooo! Sounds good to me! 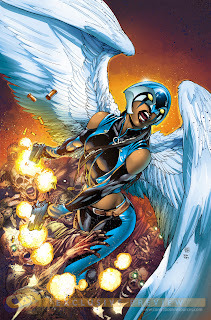 Can't wait to see what Robinson and Scott have in store for the new Hawkgirl in the pages of Earth 2. Sorry I can't post the image at the moment, but please click through and check it out! Big thanks to Honor Wings Bearer Raul Cotto for the head's up from Twitter! Over on CBR, the first image of the new Earth 2 Hawkgirl has been revealed, and it looks like our favorite Wingwoman is getting a snazzy new take! According to Earth 2 scribe James Robinson: I'm excited for readers to see this new Earth 2 version of Hawkgirl," Robinson told CBR. "As the co-creator of the original Kendra Saunders, I've taken pains to keep the essence of her personality while adding a more two-fisted quality to her as well. I'm also enjoying developing another aspect to her, in that with the absence of Batman, she must also step up and become the great detective of Earth 2. I hope readers will enjoy watching her find her place in this new world as a part of this new team of heroes. Sounds to me like this new Hawkgirl will in fact be Kendra Saunders, which makes sense considering Robinson is writing the title. And the idea of Hawkgirl as a detective is both a brilliant expansion of Kendra's character (who in the early days of JSA used her noggin along with her brawn) and a fabulous spotlight role in a series which is rapidly shaping up to be a fan favorite. The most striking aspect of the new costume is the colors! Blue and black makes me think of Aquagirl moreso than Hawkgirl, but I think it looks great and also visually seperates her from both Hawkman as well as all previous iterations of Hawkgirl. The helmet is streamlined and almost modernist, but I love the "Eye of Horus" effects around the lenses. Is she wearing makeup under her eyes, or is that part of the mask? Perhaps a cowl underneath? Also, it seems that over on the alternate world of Earth 2, Hawkgirl is now Black! Or perhaps very tan (and dredlocked). No problem at all with this -- it's a new world after all, both in the context of the New 52 and then on Earth 2 in particular. One last thing -- the twin automatic pistols. Besides making her look like she has been reading a lot of Lee Falk comics (zing! ), the use of modern weapons is a good fit for Hawkgirl. Even as far back as the Silver Age, Hawkgirl tended to use modern weapons even as Hawkman would steadfastly hold onto his ancient ones. And of course, the Hawkworld-era Hawkwoman was well known for totting guns. So it makes sense to me! So, what do you folks think of our first impression of this new Hawkgirl? Love her or loathe her? Leave a comment and share your thoughts! Big thanks to Raul Cotto (@MASFUEG0) for hitting me with the link on Twitter! You've earned your Honor Wings, Raul! Title: "Rise Of The Dead"
Summary: As the host of living dead pour across the Brooklyn Bridge into Manhattan, Hawkman swoops around protecting the humans still caught on the bridge. He soon is helped by a mysterious flash of energy, the origin of which is revealed to be the teenaged hero Static. The two heroes determine that the zombies are following the Gentleman Ghost and the Mortis Orb to Central Park, and head for Midtown. While Static keeps the zombies at bay, Hawkman attacks the Ghost. But Craddock is ready for him, first sending the apparitions to keep the Winged Wonder occupied, and then blasting him with the power of the Orb directly. Carter is able to battle back against the apparitions, as the Orb is making them somewhat more solid -- and thus more vulnerable. But just as the Ghost is about to use the orb, the spirit of the warlock Julius Gates grabs him, and the two undead fiends struggle. As Gates pulls Craddock back into the spirit realm, Hawkman grabs the Orb, and all of the zombies collapse. Static asks Hawkman what he intends to do with the Orb, and our hero says that he will take it "far away." Indeed he does, taking it to Antarctica, where he dumps the Orb into a deep chasm. Back in his building in the Bronx, Carter runs into Emma and Singh, who are watching the news reports of the mysterious Hawkman in New York. Seeking a little peace and quiet, Hawkman heads ofr a quiet rooftop. But his reverie is short-lived, as he is attacked by the alien shapeshifter Aksana! Review: The first thing you notice as you open this issue is that the art is not by Philp Tan! Though he does the cover, the interiors are done by Cliff Richards, credited as "illustrator." He handles the hordes of the undead quite well, and the action sequences look fluid and fresh. So, overall, I approve. Tan's work is such that he does need the odd fill-in here and there; I am happy that of his run on Savage Hawkman we only had the one. Daniel and Bonny are still handling the story and this issue -- being as it is essentially a big battle, being the blowoff to the arc -- is much more satisfying than the previous. There's no logical inconsistencies this time out; we get Hawkman and Static fighting Gentleman Ghost and his zombies. Sounds like a good comic book to me! I also like how Daniel once again uses the trick of introducing next issue's story in the tail end of this one, same as was done in #4. Speaking of Static, I really enjoyed his little guest spot here. His dialogue was amusing, talking about how he has an algebra test in the morning which he needs to study for, and how he found out about the zombie revolt from Twitter. (Didn't that used to be called Twitterati in the DCU? Or something like that?) I also enjoyed Hawkman's take on the young hero, saying that he "loves the kid's style." And it makes sense for two heroes in New York to run into each other when the the living dead are walking the streets of Manhattan. Overall, I liked this storyline despite a middling second chapter. Gentleman Ghost is always a welcome villain and it seemed like Daniel and Bonny were starting to hit their stride. Sadly there's only one more issue of this crew with this character, but it's been an intriguing ride so far. Image: The Savage Hawkman #7, 2012, Philip Tan. I did not partake of Free Comic Book day on Saturday, due to a combination of Hands On Greenville Day as well as the nature of FCBD at Borderlands since the new ownership came in. While I am legitimately happy for them to have that many people in their shop on a given day, it doesn't fit with what I want at that time. I've just toiled for four hours in the heat and dirt, I just want to grab my freebies and be on my way, not stand in line for and hour and a half as I snake through a store I have been in hundreds of times before. Like I said, not what I am looking for in an FCBD experience. Luckily, DC was kind enough to post a two page spread by Jim Lee teasing the upcoming Trinity War storyline, and the Winged Wonder himself figures into it. And who is Hawkman tangling with? Why, the Formerly Goateed Moron himself, Green Arrow! Some things never change! It's interesting that Lee draws Hawkman with his ancient weapons rather than his alien ones; might image this coupled with the preview sketches by Joe Bennett suggest a return to that sort of weaponry for our hero? It's been a part of the character dating back to his first appearance, so it would not exactly be a surprise to see it return as part of the New 52. Also also: Is that... Vibe?! General consensus on the Interwebs is that the red, black, and yellow clad figure on the left is in fact Vibe from the Justice League Detroit era. Truly this is a Brave New World if Vibe is back. Can Steel be far off? I'm sure we will hear a lot more about this in the coming weeks and months, folks, so stay tuned. Image: Trinity War teaser, 2012, Jim Lee. Earth 2 #1 -- James Robinson and Nicola Scott present this new take on the parallel Earth concept as part of the New 52. Early word has been very positive on this series, and I have been enjoying James Robinson's superhero stuff at DC over the last few years. Given free reign over an entire world, I imagine that Robinson will be eager to "cut loose" and get crazy. And with Nicola Scott drawing it, the book should look fantastic. We know that in a few issues we are going to meet the new Hawkgirl, and combined with a few hints dropped in Savage Hawkman #8, I think there may be some sort of revelation coming. Beyond that, this book looks like it should be worth reading. Summary: In Digby's Book Shop, Gentleman Ghost and Hawkman make their introductions, where Craddock tells Carter that it was he who arranged for him to get ahold of the old book detailing the Mortis Orb. Craddock also claims that he sought out Carter because the Nth Metal will be drawn to the Orb. Hawkman rejects this notion, and briefly engages the apparitions before grabbing Digby and busting through a window. Hawkman interrogates Digby about where he got the book, and the terrified book seller tells him about Julius Gates, a supposed warlock who had lived in a strange mansion outside the city. Hawkman (grabbing Digby by the collar) wings off to investigate. Back at Carter's apartment, Emma comes looking for him, and meets Singh. Both of Carter's friends are concerned for his safety and mental health. At the dilapidated Gates mansion, Hawkman and Digby find Gates' blind widow, Abigail. She tells Hawkman that her husband spent his life searching for the Mortis Orb, and was buried with it... and now he comes to visit her from time to time. Thanking her, Hawkman and Digby head for the cemetery, where Hawkman starts digging up Gates' grave, thinking that the Orb can defeat the Gentleman Ghost, but also unsure as to why he cannot stop when he hears spirits crying out for him to stop. He unearths Gates, and takes possession of the Orb. The Gentleman Ghost immediately pops up, and with him, the dead begin to rise from the earth as well. Craddock tells Hawkman that the Orb can raise the dead, and it will bring him back to life forever -- at the cost of the life of every man, woman, and child for miles in all directions! Craddock disappears, and Hawkman looks on in disbelief as a host of zombies shamble across the Brooklyn Bridge! Review: The Nth Metal is becoming a story crutch, where things happen solely because of it without any explanation. Why does Hawkman dig up Gates if he knows he shouldn't? Is the Nth Metal controlling him? Is the Gentleman Ghost manipulating it somehow? It's very unclear from how Daniel and Bonny present it here. Ghost says that the Metal possesses "energies and collective knowledge beyond this plane of existence," which is a great tease. But I wonder if we will ever find out what the means, exactly? Further, the sequence in the Gates mansion makes me scratch my head. How is this blind widow living by herself in this ruined old house? And why does Hawkman not offer to help her or take her to get some help? Instead he literally leaves her to die (Abigail actually says she will be back with her husband soon)! What the heck?! These oddities make it hard to really enjoy this issue. I mean, I generally like the story and I like seeing the Gentleman Ghost match wits with the Winged Wonder. But the details don't make sense and undermine the tale that Daniel and Bonny are telling. I much would have preferred seeing Hawkman's motivation for getting the Mortis Orb be well intention but misguided, rather than "for some reason... I can't [stop]". It's touched on briefly in a caption box where he says that he thinks the Mortis Orb can help him defeat Gentleman Ghost and his apparitions, but it seems too light. Tan's art is still wonderful. He really is in his element with all the shadows and ghosts and zombies. The splash page of Hawkman charging through the field of apparitions is fantastic. And the last page, showing the zombies slowly making their way across the Brooklyn Bridge, is an amazing cliffhanger image (not to mention a great homage to Lucio Fulci's Zombi 2). Overall, I liked this issue quite a bit when I first read it, and it's still good. I still like it, but the cracks in the story logic are irritating and it hurts my enjoyment overall. The excellent cliffhanger helps, though, and it makes me want to get onto the next issue. Image: The Savage Hawkman #6, 2012, Philip Tan.